We are lying at the foot of the Langeberg Mountain trail. 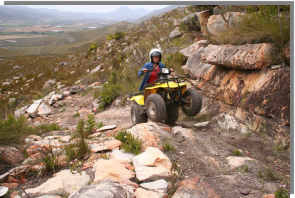 Our trails go all the way to the top of the mountain and the trail is a hand built track that is just the size of the Quads we use (160 LTF Suzuki). Unfortunately quad bikes that are wider than the ones we use, cannot fit on to the tracks that go to the top of the mountain. 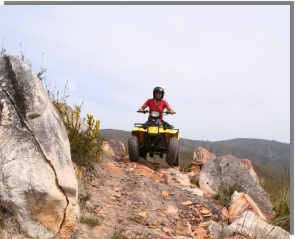 Only the 1 hour trail is suitable for all quad bikes. The mountain trail is very bumpy and you need to be skilled to do it. This is for the adventurous ones. The full mountain trail takes 6-7 hrs and you rise over 500 m in altitude. We take a picnic lunch with us and enjoy it in this majestic setting, a scene that will always stay with you. If you do not have the time or the guts to do the full mountain tour, you can do a 1hr or a 2hr trail as well.